Phola Coaches drivers at Wits University worry about their accommodation following unlawful lock changes. Drivers of Wits buses came home two weeks ago to find that the locks of their rooms had been changed, but were not provided with the new keys. 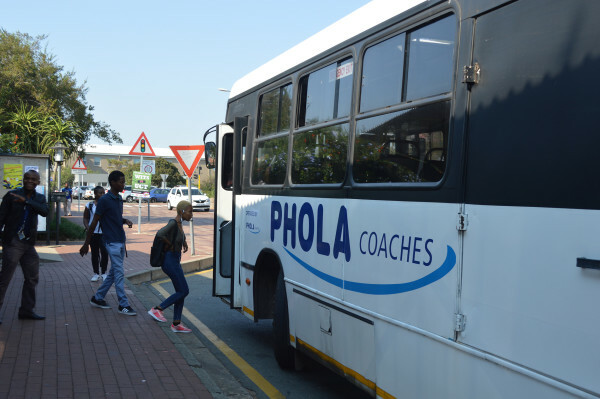 The drivers say they have, on several occasions, asked Cornelius Simethi, the depot manager for Phola Coaches, for the keys, without getting a response. They say this has left them confused, and worried that they may be locked out of the rooms. Wits Vuvuzela reported on March 20 that the drivers, employed by the service provider and not Wits, are living in cramped and unsanitary conditions in staff rooms provided for them on the main campus in Braamfontein. Some drivers said they chose to sleep in their cars rather than in the staff rooms due to the cramped conditions. There are about 30 drivers who have been allocated only two rooms at the university’s staff quarters known as Nkomponi since 2014. They say their grievances about their living conditions have not been attended to by Phola Coaches. Instead, the drivers say they received eviction threats in February, which they rejected. Senior management then ordered them officially, in writing, to vacate the quarters within 90 days, effective from the beginning of February 2017. “…Our 90-day notice will be ending at the end of April, our 90 days aren’t up yet but now they have changed the locks,” said one driver who didn’t want to be named for fear of victimisation. The drivers allege that Simethi changed the door locks without authorisation from the university. The drivers deny that they have not been given keys to the room in the past. They say a single set of keys was given to one of them, but because of constraints surrounding only having access to a single set of keys, the drivers resorted to leaving the rooms unlocked. Ezekiel Nethononda, a locksmith at Wits, said the university had not received a requisition form for the drivers’ rooms locks to be changed. The matter has been reported to the National Education Health and Allied Workers’ Union, which the drivers have recently joined. The drivers and the union say they are monitoring the situation closely to see what next step Phola Coaches takes.